I baked in pans this weekend. No, there’s nothing wrong with my baking stone. 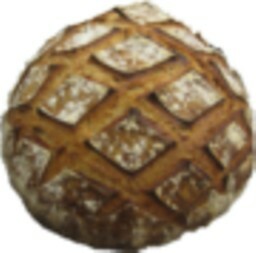 I just have freezers full of baguettes, miches and other hearth breads. Also, I was (and am always) craving scones (using Breadsong’s technique). My wife was urging me to make another whole grain-y sandwich bread. And I wanted a good accompaniment for Pollo Cacciatore. So, it was scones, Hamelman’s Oatmeal Bread and Reinhart’s BBA Focaccia. Breadsong wrote about flaky scones a couple months ago (http://www.thefreshloaf.com/node/21414/flaky-scones-flavor-variations). I had done a couple variations before (http://www.thefreshloaf.com/node/21496/people-who-live-glass-houses-shouldn039t-stow-scones). This time, I wanted to try a tart and fruity variation. 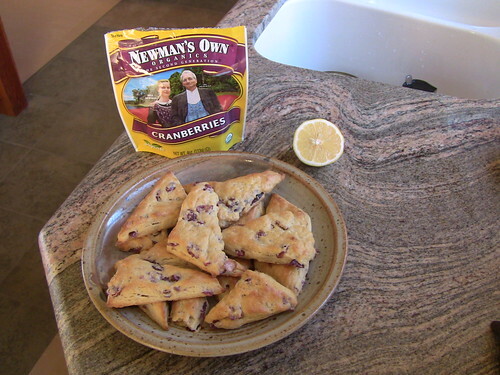 I looked at some lemon scone recipes to see different approaches to getting lemon flavor in scones. Some use lemon zest, some use lemon juice, and some use lemon extract. I used all three. I also added some dried cranberries, soaked in water overnight. I squeezed out the excess water in a sieve, but the dough was still too moist. So I added some flour in the mix. Next time I’ll reduce the other liquids. The scones came out with the same wonderful texture as before, moist on the inside and crispy on the outside. But they didn’t rise up quite as much. And they could have had a stronger lemon flavor. So next time I’ll use more lemon zest, or maybe candied lemon peel. But even though they could be improved, these scones were dang good. Having enjoyed making –and eating-- AW’s whole wheat bread last week, I decided to try another partially whole grain sandwich bread. 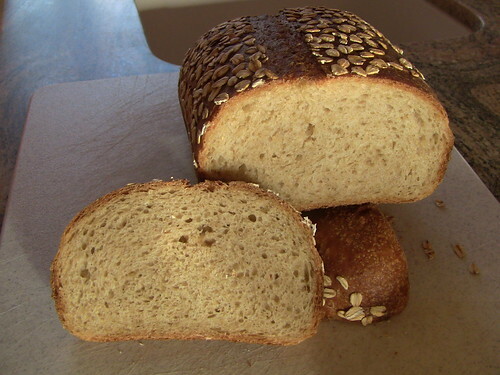 I chose the Oatmeal Bread from Hamelman’s Bread: with 25% whole wheat flour and 75% KAF Sir Lancelot. Believe it or not, I made this bread exactly per the formula, with no variations. Believe it? Well, ok…I did substitute molasses for 1/3 of the honey, just because we love the dark, rich flavor. 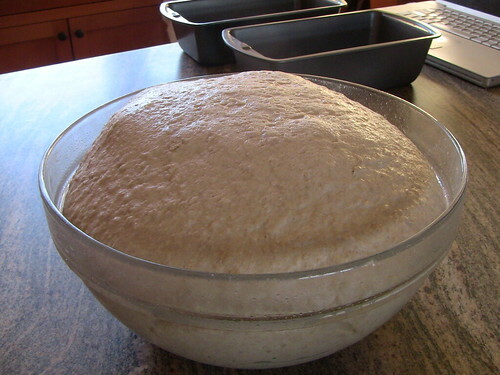 The dough was fermented for one hour after mixing and kneading, stretched and folded, then refrigerated. It almost tripled by morning. Seriously gassy! It proofed about 2 ½ hours since it had to get to the temperature the yeasties like. The home-baking formula for this bread in Bread made enough for two loaves in 9 x 5 pans and six 3-ounce rolls. The bread has a wonderful tenderness and a wholesome oatey-wheaty flavor. It was excellent for a dinner of turkey and cole slaw sandwiches. This is a real good sandwich bread and I’ll bake it again. Monday night we are having dinner at home with a friend of a friend, who is a writer for the New York Times, and a serious foodie. In fact, she wrote a wonderful book about the history of Chinese food in the U.S., called The Fortune Cookie Chronicles. I’ll be serving Pollo Cacciatore, my variation on an excellent recipe Brother David shared. I think one needs Focaccia to sop up the delicious gravy. Since we are traveling back to SF from our North Coast getaway on Monday, and since the Pollo Cacciatore is best re-heated the second day, I made both the chicken and a Rosemary-Garlic Focaccia Sunday. Well, more accurately, the Focaccia dough was mixed, fermented, folded, shaped and slathered with garlic-rosemary oil Saturday evening, and retarded in the fridge overnight. 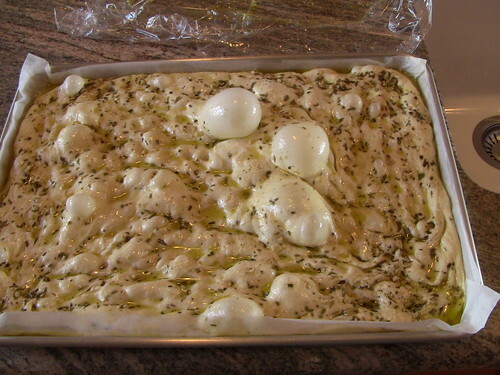 I looked at a lot of Focaccia recipes and the BBA formula seemed like a good place to start. I figure, if I’ve got the book, I might as well use it. This dough is a monster—sloppy and hard (but fun) to manage. After the third fold and a one-hour rest, it was like a big jiggly pillow. It easily expanded to fill the 17 x 12 sheet pan. When it had warmed a couple hours the next morning, it had serious eruptions. I’ve never seen bread bubbles quite so large. Like volcanos. 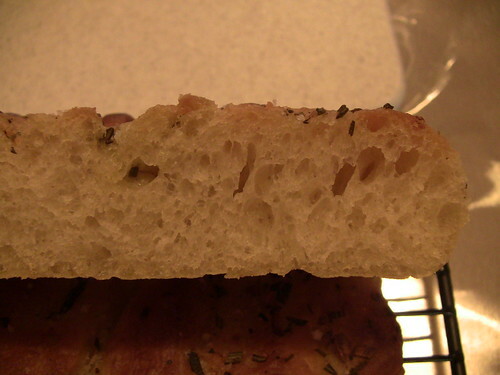 The crumb is airy and tender and the flavor is outstanding with a strong, but not overpowering rosemary and garlic flavor. 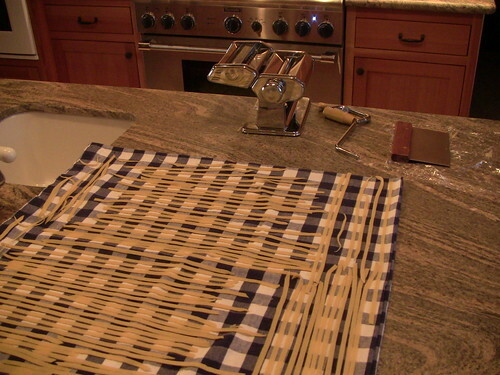 We also made fresh pasta today to eat tomorrow with Pollo Cacciatore and re-heated Focaccia. Gonna be good. All in all, a good cooking and baking weekend. We also got some good hikes in, and enjoyed the varied animal and bird life of the North Coast. 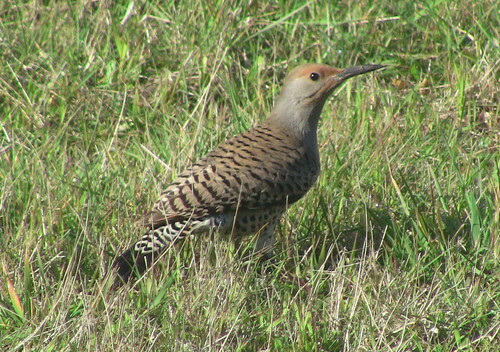 Including a rare sighting of a Flicker right on our meadow. The oatmeal bread looks stunning and 2 day old focaccia is my favorite. Somehow, it always tastes better on the second day. Lovely baking, Glenn. Glen, the loaves, focaccia, and scones look stupendous. I'm quite sure it all taste great too. It's been great reading your posts from beginning to end, you have become quite the baker. I will have to argue with you over brunch about the scones though, I would have went with the lemon-ginger route if I was making lemon scones...or I suppose orange-cranberry if I had to use cranberries in my scones. To each his own, as long as you have warm tea, I'd be content. The lemon and cranberry combination was very enjoyable with a homemade cappuccino. I love ginger but my Number One Sconophile does not. Rum-soaked raisins are next. I would be happy to discuss Current Developments in Sconology over brunch some time. All Look great, Glenn, especially the Oatmeal Bread. The Crust Crumb look indicate a well shaped and proofed Dough, spot on.. I'm sure your wife was pleased, as will be your dinner guests. Nice bake. 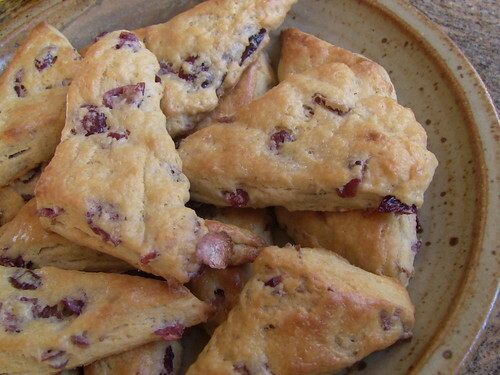 I am so happy you like the scone recipe! It looks like you got some nice, quality cranberries and I bet those scones are delicious! Your oatmeal bread is perfect, and I'm sure your bubbly focaccia will be enjoyed by your (fortunate) dinner guest. And, your photo of the beautiful Flicker is spectacular! What a great choice you now have on the counter of freshly baked goods! I think that spring is in the air my taste buds are wanting a change from the heavier whole grains to something lighter and sweeter and you have picked 3 of my favorite and baked them up beautifully. Your scones look so delicious...I could eat scones everyday. I love dried fruit, especially tart cherry..I don't soak the dried fruit, just add nice freshly dried ones and the little chew is delightful, I think there is more flavor in the fruit this way. I even add 'fresh frozen' cranberries, just give them a little chop right out of the freezer..the little tartness is great with a drizzle of icing or sugar crystals on top of the scones..I often use fresh cranberries in cakes even whole at times..I love these and stock up the freezer..the color when they burst is gorgeous...they keep for months frozen! 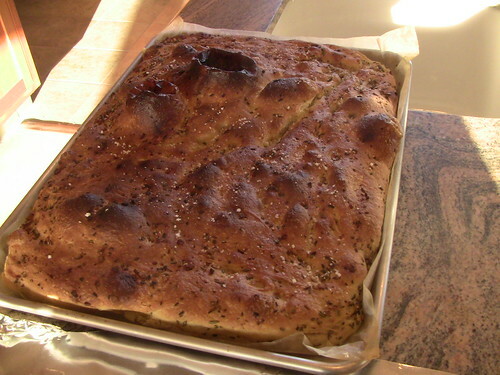 I just baked focaccia the other rainy soup day..! I love Cyril Hitz version, very large, thick and airy, works great sliced lengthwise, makes plenty for great sandwiches and panini grilling. You can veiw him making and baking it on youtube! 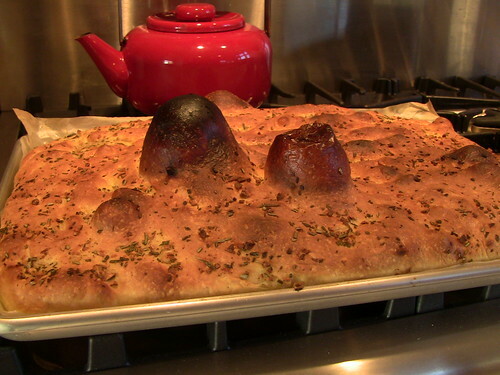 Focaccia is such an easy bread to make...I especially like it in the wfo oven because it is so convenient timing wise and works well with burning coals left in the oven...adding flavor much the same as it to pizza. I appreciate all the nice comments. These were all good bakes. And I can't wait to try the fresh pasta. The problem with a three-day weekend is it's not four. If I'm going to spend three days cooking, baking, kneading pasta dough, hiking, beach-combing and weeding and pruning the garden, I need a day for a long hot bath and a massage. I have sore muscles where I didn't even know I had muscles. It all looks great, Glenn! I'm waiting for tasting notes on your first home-made pasta. I'm anticipating amazement. The pasta was excellent. Great flavor and texture. But the Pollo Cacciatore would have been good on any old pasta. I think I'll be making handmade pasta regularly. Thanks, David, for the consult. I ended up letting the noodles dry for about thirty minutes, then dusting them lightly with flour and storing them in an airtight container. They came apart easily a day later. They cooked al dente in three minutes. Yummm! Everything looks wonderful & if your pollo caccitore is as good as your lamb soup your guest will be writing about your feast in the NYT! I'll bet Tasha looked out the window at the bird in your meadow and thought, "if dad would just let me out we'll call it brunch!" I was a slug this weekend...did a half marathon on Saturday morning & only baked Amish rolls for soup on Sunday. The meal was excellent. Not sure if it was better than the Greek meatball soup. But now I think that soup would be even better with homemade noodles in it. Poor deprived Tasha is not allowed to eat Flickers. And slugs don't do half marathons. What's the name of your bakery, Glenn? 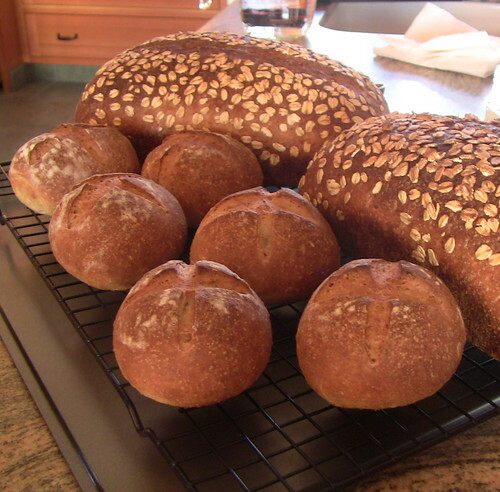 What a gorgeous assortment of breads (and quantity, as well)! Are you feeding the neighborhood yet? I'm thinking you wouldn't have to deliver, just open up the windows in your house. The crumb on your focaccia is particularly nice! You know how much I love to name things. I've already decided that when I come up with my breakthrough French bread formula, it will be called Pain de Monium. I haven't thought about naming a bakery, but I'll work on it. You've hit on the supply-exceeding-demand problem. I have a dozen or so loaves frozen at any given time. All of them thaw nicely, but I should either bake less (not gonna happen) or make smaller batches (could happen) or start taking bread to my office for co-workers (should happen). Thanks for your nice comment. The focaccia is really nice. Tonight, we split some lengthwise, toasted it briefly under the broiler, then melted fresh Mozzarella on it. A yummy twist. Hi Glenn, nice baking! What's the texture of the scones? Are they at all moist? Only time I've had scones, they were quite awful - dry and nasty texture, so I tend to stay away. The first time I made the Hamelman oatmeal bread, my bowl of dough also nearly overflowed during the night. The second time (made for the Hamelman challenge, which I've yet to write about), I went back to the book and read the first page of chapter on straight doughs. Saw I had missed the point about degassing the dough after it's been refrigerated. I only folded once a couple hours into the retarding period since the dough felt pretty strong. Not sure if it affected the end result, but the dough was much more well behaved overnight. Tasty bread, for a straight dough. on the inside, and lightly crunchy on the outside. You really should check out Breadsong's formula. It's a winner! As to the oatmeal dough, I folded it once before it went beddy-by. In the morning, I de-gassed it in dividing. The crumb was close to perfect. I agree the flavor is wonderful for a straight dough. Thanks for the scone recipe! I have some cranberries and I love scones.